"Bajohr’s study, a kind of grassroot history, cannot be praised highly enough. Not only is it a superb monograph on the topic at hand, it also provides a wealth of information and insight into the inner workings of Hamburg’s economy and government, as well as on various aspects of daily life during the Nazi period. It is full of illuminating detail." Bajohr's clearly argued and carefully documented study both expands our understanding of the complex processes of 'Aryanization' and questions previous interpretations of its timing and agents ... Perhaps most importantly, it chronicles how a large proportion of ‘Aryan’ Germans came to see economic exclusion and expropriation as legitimate and desirable projects." "... the first that deals with the economy of a single city ... a well-written work that would appeal to scholars and those interested in a deeper understanding of what contributed to the Holocaust." "... an excellent study ... Bajohr demonstrates – in a fascinating final chapter…-the degree to which the economic embodiment of anti-Semitism reveals the Holocaust to be grubby, mundane and everyday, as well as horrific and unimaginable." "Bajohr's study, a kind of grassroots history, cannot be praised highly enough. 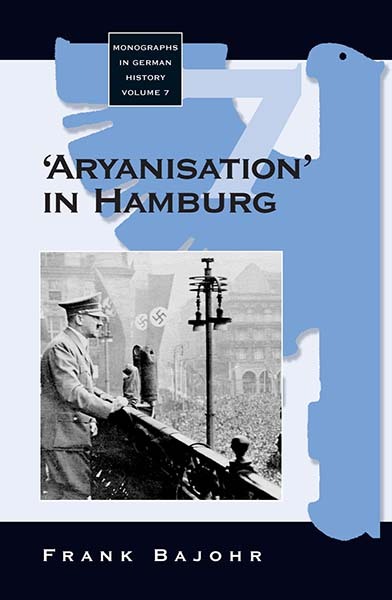 Not only is it a superb monograph on the topic at hand, it also provides a wealth of information and insight into the inner workings of Hamburg’s economy and government, as well as on various aspects of daily life during the Nazi period. It is full of illuminating details, the presentation of which never becomes tedious, for each fact throws light on another facet of the whole." Frank Bajohr is a historian at the Forschungsstelle für Zeitgeschichte in Hamburg and lecturer at the Department of History at the University of Hamburg. At present he is a Research Fellow at the International Institute for Holocaust Research at Yad Vashem, Jerusalem.